The architecture group Grlmshaw & Partners Ltd from London has designed the building of the new airport. Each element has its own meaning: the rippled ceiling, underneath which all the check-in formalities are taking place, has a symbolic connection to the curves of the Neva river. The roof, which shimmers with the gold light in sunny days, resembles the spires of the Peter and Paul Cathedral and the Admiralty. The airport terminal has already been recognized before for its customer oriented features as well as for the unique interior and exterior design. In 2014 it has won the Structural Awards prize in nomination "Infrastructural and transportation projects". In 2015 the Airport Council International has announced Pulkovo as the best airport in Europe for the customer service quality. 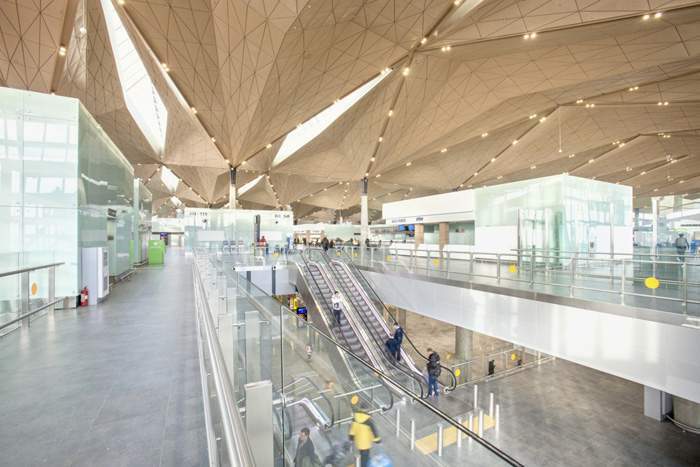 In spring of 2016, the magazine Entrepreneur has called the terminal design as the most interesting in the world.